"This is a yummy treat that everyone will love!!" Combine brownie mix, oil, egg and water in a large bowl. Stir 50 strokes with a spoon. Place batter in a cupcake pan (cupcake wrappers recommended). Once cups are 3/4 of the way full, place an unwrapped miniature peanut butter cup in the middle, then bake for 30-35 minutes keeping an eye on them while they're baking. Let them cool and then they're ready to eat!! This was yummy, but you will need to follow the recipe on the brownie mix box rather than on here because it won't turn out right otherwise. 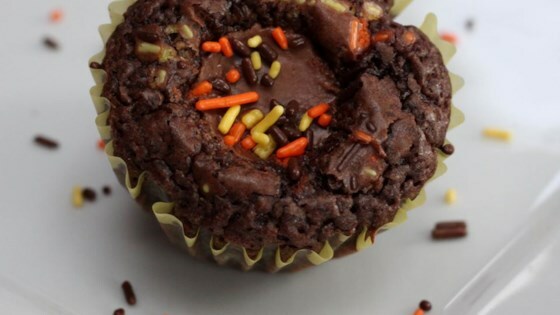 These were great, but I made them in a mini muffin pan and waited to add the candy until after 1/4 way through the cooking time.